Is there any data on how many are Touring model? Sorry if this was already asked. Thanks for the effort. Great info. None of these car have the touring package as none have completed production as of last Friday. Ok thanks. My Touring went V260 on Friday (10/27), and will go V270 (completed production) around 11/10. Iâ€™m amazed how many guards red cars so far. It was available in the .1 is it cause the first car that hit the news was GR? These stats do make me reconsider my headlight choice. Was trying to save a few $$ and not get led but 85% will have them. Chris does your car have a lot of cxx options? Normally it would only be a few days going through. Good work guys, thank you for sharing this information. No cxx options. I'm just going off my tracking sheet, sent by my SA. 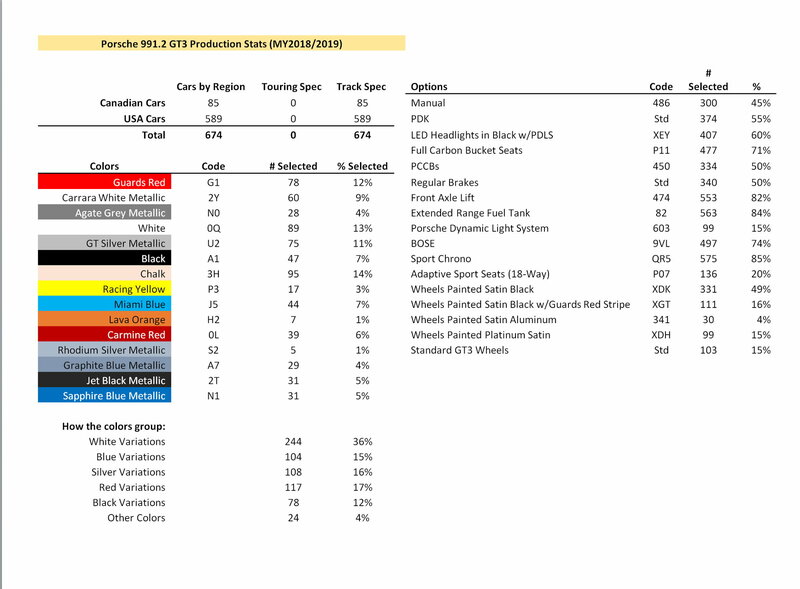 GT car production is going to depend on the demand for 2018 911 and 718 cars, IMO. Both of which which are produced at the same factory and which has an upper limit to it's production. Generally, high demand for 911/718 cars reduces GT car production. On the other hand, slack 911/718 sales (which is happening now) means more GT cars. Great work. I am not sure I would put agate in with Silver or chalk in with white. I would add “Grey” and lump agate and chalk together, but that is just me. I agree the blues are very different from one another as noted above, but I do see them all as being blue. Any intel on how many have full leather v rubber dash? Any intel on how many have full leather v rubber dash? I'll try to put together some stats for you. Last edited by CamsPorsche; 10-31-2017 at 02:19 PM. I guess we wore out Sapphire Blue color with the .1 and GT4. lol. And rhodium silver. Both were very popular .1 GT3 colors, but not so much this time, likely due to GT silver finally being cheap and Miami blue being available on the .2. I have PCCBs because I track. Have you gone through many sets of PCCB pads?